Most times we can open jars of food with little to no problem, a bit of pressure is applied as we’re twisting and then “pop”, the seal is broken and the lid comes off with ease. Occasionally though it just won’t budge, even after bringing some serious muscle power to the job…so how does one remove them? Take a butter knife and give the lid a few good wacks along the top edge (turning the jar incrementally while you hit it), this should help break the seal and make the lid come off easily. Use the smooth edge of the knife (or the handle) against the lid and you’ll need to whack it (not light taps), but not so hard you shatter the glass. This is the method my grandmother taught me as I was growing up and it’s my “go-to” fix when problems arise, I’d say it has a 99% success rate. Put on rubber or latex gloves so you can grip really well when twisting. Lightly moisten a dishcloth or towel and use that to grab hold of the lid and twist, this also gives you more gripping power. Try breaking the seal by running the jar under hot water for up to a minute (tilt jar down so the water can reach the underside of the lid). Giving the lid a few wacks with a butter knife while doing this can also help speed up the process. You can also put the jar upside down in a bowl of hot water (just an inch or so deep to cover the lid edge) and leaving for up to a minute before trying again. Rubber bands will do the trick too! You’ll need a wide one to place around the lid edge then grab hold of it to squeeze and twist. Not working? Try another wide rubber band, this time placing around the glass jar so you have two firm places for gripping. Keep a square of rubberized non-slip drawer and shelf liner in with your kitchen gadgets, this can also be used to give you more gripping power (drape over jar before twisting off lid). 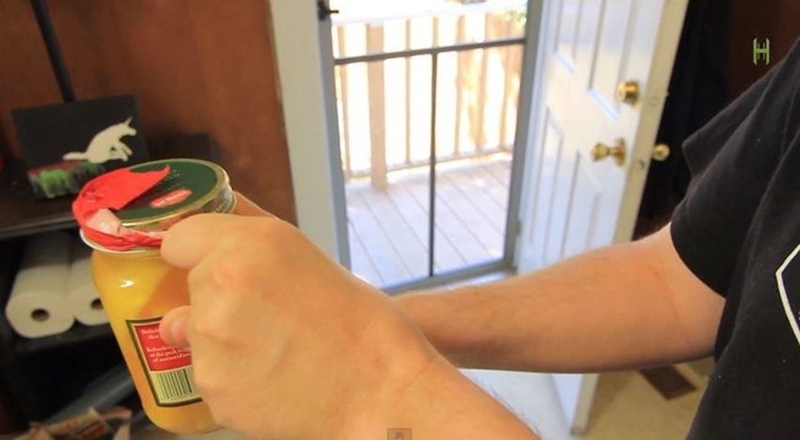 Try breaking the seal by giving the bottom of the jar a good wack with the heel of your open hand. You may need to do this a couple times. You could also wack the bottom on the countertop (cover with a towel first to prevent damaging the surface), do so with enough force to break the seal without shattering the glass. Server responsed at: 04/22/2019 4:32 a.m.